The indigenous people of the world have lost the rights enjoyed by the Adi Vasis in Sri Lanka. 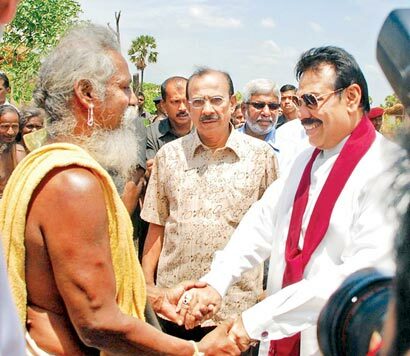 The government of Sri Lanka as a people-friendly government will stand for strengthening and safeguarding the rights of the Adivasis said the President Mahinda Rajapaksa addressing a ceremony held yesterday on the Sallativu coast in Vakarai to coincide with the World Indigenous People’s day. Addressing the gathering, the President noted that the government will provide a conducive atmosphere for the Adivasis, where they can live with dignity. President Rajapaksa pointed out that Adivasis have been given due recognition at all times. As a result of that, the Adi Vasi Chief Vanniyalatto is permitted to carry his axe to the Temple Trees when all others are banned to carry weapons. He can hold talks even with the President. It is because of the trust placed in these people who are also of our own. The President further added that the Adivasis were also badly affected by terrorism. “Their children were forcefully taken away by LTTE cadres who recruited these children as child soldiers. But now every person in the country can live with a peace of mind sans fear of death”. President. not forgetting to address the Adi Vasis in Tamil, called on them to protect their traditions and not to forget their past history. Addressing the gathering the Adi Vasi Chief Uru Varige Vanniyalatto said that although leaders of other countries forget about Adi Vasis after participating in world conferences it is not the policy of the President. He expressed his gratitude to the President for participating in a function connected to the Adi vasis. Nearly 1000 indigenous people from various parts of the country including Ratugala, Pollebedda, Hennanigala, Dalukana and Dambana were present. The International Day of the World’s Indigenous People is celebrated around the world with a view to recognize the indigenous communities and their achievement and contributions given in solving world issues such as, environment conservation. Ministers S.M. Chandrasena, T.B. Ekanayaka, Deputy Minister V. Muralitharan and Eastern Province Chief Minister S. Chandrakanthan and several other political and community leaders participated in the ceremony.